Installing the right combination of plantings is critical to maintaining a beautiful landscape design. Plants that offer seasonal color can help you establish visual interest, provide direction, and give your landscape the finishing touch it’s been missing. Different types of plants bloom at different times of year, so we recommend installing a wide mix of flowers, shrubs and trees, and other native plantings to successfully establish seasonal color. Trees – Red Maple produces red buds in fall, while Yellow and River Birch produce golden yellow colors. To really make your landscape pop, consider the purple of Black Gum or Scarlet Oak. Shrubs – Common Alder produces fall color in shades of yellow or orange, as does Virginia Willow, while Black Chokeberry blooms in shades of purple. Perennials – To produce white flowers in fall, choose White Wood Aster or Common Boneset; for shades of purple, New England or New York Aster, Monkeyflower, or Pickerel Weed; for yellow, Seaside Goldenrod or Black-Eyed Susan. Shrubs – Green Mountain Boxwood produces bright green foliage, while Winterberry produces bright red berries, and Spicebush develops yellow flowers during late Northern Virginia winters. Red Twig Dogwood also displays red in its stems, and its leaves are often tinged with shades of blue or green. Trees – Both Silky Dogwood and Flowering Dogwood blossom with white flowers, typically during mid spring. Shrubs – Black-haw Viburnum also produces white flowers. Forsythia, Azaleas, and Sweetspire produce spring color as well, while lilac adds an extra dimension of fragrance. Perennials – Hepatica can produce flowers in white, pink, blue, or purple; Virginia Bluebells, blue color; Wild Stonecrop, white color; and Marsh Blue Violet, purple color. Trees – Sweetbay Magnolia has white flowers that bloom in summer and produce a lemon scent. Shrubs – Hibiscus adds vibrant shades of red, pink, or yellow, while butterfly bushes can be found in purple tones. Azalea bushes can also produce white flowers during the early summer months. 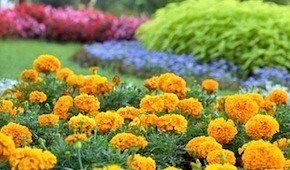 Perennials – Marigolds produce white flowers in summer (as well as spring), while geraniums and ironweed offer purple flowers. At O’Grady’s Landscape, we’re experts in creating garden designs with seasonal color perfectly suited to the Northern Virginia climate and environment. If you live in Great Falls, the City of Falls Church, North Arlington, McLean, or Vienna, let us help you establish seasonal color and visual interest with the picture-perfect plant combination. Request your consultation today for more great suggestions and personalized advice!